Our friend RL brought some ginger bread cookies over to our house to try. 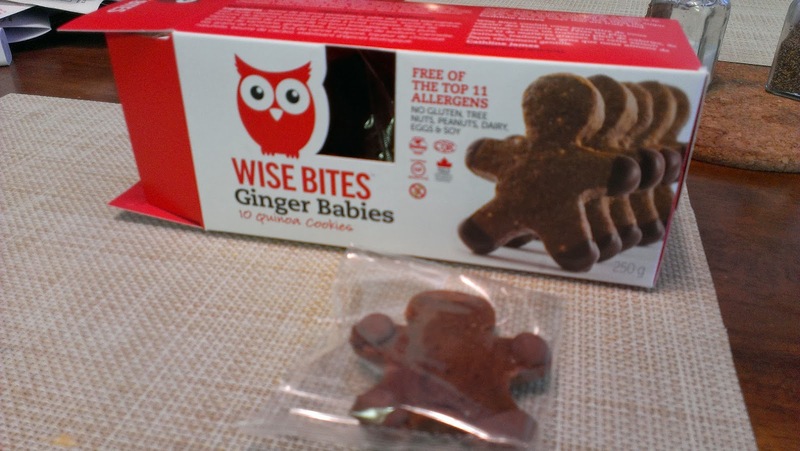 They are called Wise Bites Ginger Babies cookies. They are gluten free, nut free, kosher, dairy free and soy free. They are made out of a bakery in Richmond, British Columbia. Yay Canada! They seem to have a big line of gluten free cookies you can get and are allergy conscious. Check out their line of gluten free products. So here are out thoughts on these cookies. I'll be honest, Amanda didn't like them, but I did. The cookies have a quinoa and date base. Amanda tends to not like products that have dates in them. The Lara Bar is the only one date based product that she likes. But she gets the peanut butter, chocolate chip ones to mask the taste of the dates. I on the other hand, grew up with a Moroccan family that ate dates on a weekly basis, so to me this cookie brings familiar flavours that I refreshingly enjoy. So if you are like Amanda and don't really like dates, you may not want to try this. But if you have kids that just want a ginger bread cookie, you may want to!